It's already been 20 years since French Impressions, the Watermans' monthly talk and screening about French cinema started! 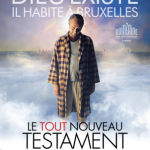 To celebrate this anniversary, Watermans is organising a special event with the screening of The Brand New Testament, after-screening party and tons of surprises! The event will start at 1pm with a talk. To book for the film only on this day, please contact the Box Office.